A Grand Admiral Thrawn and Darth Vader team-up? Yep, definitely one of the best ideas in the history of best ideas. A typical buddy story though, this is not. 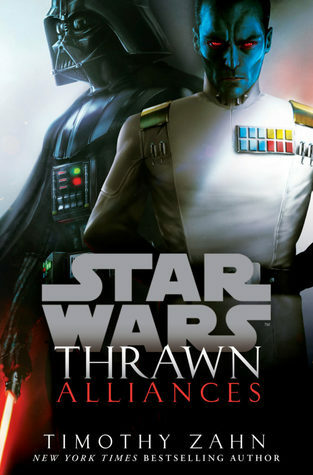 Thrawn: Alliances is the sequel to the Thrawn, at the end of which our eponymous character meets the Dark Lord of the Sith himself. Following his defeat in season 3 of the animated Star Wars: Rebels, Thrawn is summoned by Emperor Palpatine to his throne room along with Darth Vader, where they are given a joint mission to investigate a force disturbance on the far-flung planet of Batuu. It would be a good learning experience for both of them, the Emperor reckons knowingly, watching his powerful apprentice and accomplished admiral comply reluctantly to his orders. Frequently at odds when it comes to matters of the Empire, Vader and Thrawn don’t exactly make a picture-perfect partnership, but Palpatine also knows something no one else does: the two of them have worked together before. Flashing back to a period set during the Clone Wars between Attack of the Clones and Revenge of the Sith, Anakin Skywalker says good bye to Padmé Amidala as she prepares to embark upon a clandestine diplomatic mission. After she goes missing, Anakin takes off in search of her, on the way encountering a mysterious officer of the Chiss Ascendancy named Commander Mitth’raw’nuruodo—Thrawn. Desperate to find his wife, Anakin decides to team up with him for the sake of efficiency, even though Thrawn’s shadowy purposes in the system have yet to be figured out. I confess, when I first discovered the duo timeline format of this novel, I groaned a little inside. I’m not a big fan of multiple timelines in books, and the last Star Wars book I read that utilized this device did not go so well. I’ve got to hand it to Zahn, though; the flashbacks sections were woven neatly through the narrative and he managed to juxtapose past and present smoothly, mirroring certain events and bringing important themes to the forefront. Speaking as someone who isn’t all that enamored with the author’s past work and thought the original Thrawn trilogy was a little overrated, I was actually quite impressed with the ingenious way the story of Thrawn: Alliances played out. I also loved the dynamics between our two main characters. Readers got to experience the evolution and growth of Thrawn in the preceding volume, watching him rise through the ranks to become one of the most powerful figures in the Empire. This puts him nearly at the same level as Darth Vader in terms of influence and the attention he receives from Palpatine, resulting in a palpable undercurrent of resentment between the two powerhouses who are in constant competition for the Emperor’s favor. Thrawn is still in repentant mode following his recent defeat, and Vader knows just how to twist the knife, using the incident to question the Chiss’s loyalty to the Empire. Thrawn, however, is well aware of his own clout and is unconcerned with the accusations, proving himself to be one of the few people in the galaxy who can question the Sith Lord’s orders without being immediately force-choked for his insolence. In the Clone Wars timeline, the relationship between Thrawn and Anakin is lot a different. Young, brash, and impatient, Anakin is solely driven by his main objective to finding Padmé, and calm, logical Thrawn is the counterbalance to this impulsiveness. Though Anakin often chafes at Thrawn’s more levelheaded suggestions, there is also a sense of grudging respect from the young Jedi for the Chiss commander’s tactical thinking and strategic brilliance. The only aspect I didn’t like about these past flashbacks is Padmé POV, which I thought got in the way of the relationship development between the two protagonists. Though I understand why her perspective would be needed, her chapters were slower comparatively to the action-packed sections featuring Thrawn and Anakin who are like secret agents on a fact-finding mission to get to the bottom of her disappearance. Following the recent trend of Star Wars novels exploring the world of the “bad guys”, Thrawn and Vader’s story also presents readers with an interesting point of view with regards to the inner workings of the Empire. Both characters have their own team of underlings, showing stark differences between their management styles and how they are viewed through the eyes of their respective subordinates. I also feel that this new Thawn is more nuanced than his now-Legends counterpart. In the new canon, the grand admiral is portrayed as less evil, with good intentions and laudable qualities such as loyalty and respect to the men and women who work under him. While it would be a stretch to call him a good person since he still works for the Empire while admitting they are tyrannical, I can see how he could be considered a lawful neutral character—a respected opponent rather than a true villain. It’s a testament to Zahn’s skill, for he’s able to make Thrawn relatable and admirable, even if you don’t agree with his every move. In sum, if you enjoyed the first Thrawn book of the new canon, then you’ll probably wish to pick up Thrawn: Alliances for the continuation of the character’s story arc. It’s a worthy sequel which I would also recommend to Star Wars fans, especially if you followed either Star Wars: Rebels or The Clone Wars animated series (the latter of which is going to be returning with a new season, as was recently announced). And of course, if you love the characters of Thrawn or Darth Vader, then this book is an absolute must-read. Audiobook Comments: Another fantastic performance by the very talented Marc Thompson. His Darth Vader voice isn’t the best I’ve heard from a Star Wars narrator (that distinction would probably go to Jonathan Davis) but his Thrawn is pretty spot on. Listening to a Star Wars audiobook is always a treat. I also like that they show the men having subordinates. I’m not sure I’ve seen or read much where Vader has a staff, but it makes sense he would have one. THAT seems like it would be fascinating to read about! I wonder if there’s a high attrition rate due to Force- choking?!? Seriously though this has me intrigued. TBH, I was’t a huge fan of Heir to the Empire either, despite it being beloved among the Star Wars community. I think the genre of media tie-ins has improved by leaps and bounds since then though, I love these books now! oh a new star wars story! There’s usually a new one every few months, but this was one I was very interested in! I never did check what the library has, I am sure it’s mostly movie tieins.. I enjoyed it. At first I didn’t like the inner Jedi voice… but ended up thinking it was a good way to help portray the characters’ differences. Yeah, I think Zahn did something similar with the previous book, where he had Thrawn internal monologuing the sensations he received from reading others’ facial expressions and heat. This time, it was Anakin’s inner Jedi. At first, it was distracting to me too, but I agree, I understand why they had to be there. I’ve quite enjoyed “Thrawn”, and – admittedly, a very long time ago – considered Zahn’s original Thrawn trilogy to be among the best SW expanded universe had to offer. I actually didn’t know there was going to be a sequel to Thrawn – so thanks for the review! Another Star Wars book – and lets be honest, another book that I’m probably not going to pick up – there seem to be so many of these on the market that I simply wouldn’t know where to begin. You seem to be enjoying this series – or at least this instalment.